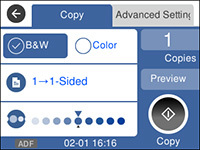 Place your original on the scanner glass, or place multi-page documents in the ADF. Load the paper you want to print on in the product. Note: Load only the recommended number of sheets. Select the Advanced Setting tab and select Original Type. Select Text or Text & Image. When you are ready to copy, select the Copy tab and press the Copy icon.